Collegium Musicale Chamber Choir was chosen to perform in the ISCM World Music Days in Tallinn 2019. The concert will take place on 4th of May in Tallinn St. Mary’s Cathedral (Dome Church). Conductor Endrik Üksvärav. Estonian chamber choir Collegium Musicale was founded by conductor Endrik Üksvärav in October 2010. The repertoire extends from renaissance to contemporary music. The special place in the repertoire belongs to the Estonian composers: Arvo Pärt, Veljo Tormis, Erkki-Sven Tüür, Helena Tulve, Tõnu Kõrvits, Mirjam Tally, Pärt Uusberg etc. In October 2017 Collegium Musicale won EBU International competition “Let the Peoples Sing” – adults category and Grand Prix with Silver Rose Bowl. In 2018 Collegium Musicale and conductor Endrik Üksvärav won the Music Award 2018 of Estonian Cultural Endowment for the brilliant promotion of Estonian choral music and for a dedicated and high-level presentation both in Estonia and abroad. Collegium Musicale – sounds good! Conductor and singer Endrik Üksvärav has completed trumpet and French horn studies as well as studied conducting. Throughout the years he has developed deep interest towards performing early music, both as a singer and a conductor. He has sung in Vox Clamantis, vocal ensemble that started with Gregorius chant. Endrik Üksvärav has conducted several brass orchestras, chamber orchestras and chamber choirs. His true ambition is the high-level performance of Estonian music both in Estonia and abroad. In 2010, Endrik Üksvärav assembled the chamber choir Collegium Musicale that during a short period of time has achieved excellent results at top European competitions. Endrik Üksvärav and Collegium Musicale have had the joy to collaborate with top composers such as Veljo Tormis, Erkki-Sven Tüür and Tõnu Kõrvits. 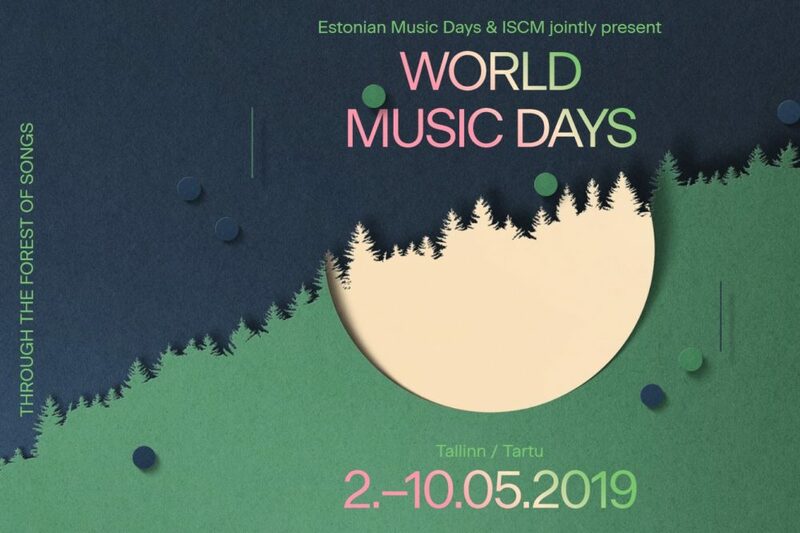 Estonia with its capital Tallinn is honoured to organize the prestigious annual contemporary music festival – World Music Days 2019 – initated by the International Society for Contemporary Music. The festival hosts hundreds of professional musicians and presents the freshest and most exciting new music in 2019, including music performed by groups of different sizes and nature, soloists presenting different instruments, as well as sounds from different acoustical and electronic sources. Since its founding in 1922, the International Society for Contemporary Music has been the world’s premier network for new music. Each year, its festival is hosted in a different city around the globe. Vancouver hosted the ISCM World New Music Days in 2017 whereas in 2018, the festival took place in Beijing, and Tallinn will be succeeded by Auckland, New Zealand in 2020. According to the concept of the festival, there will be at least one piece on the programme from every member country of the society and in addition an abundance of Estonian music – both new commissions and highlights of the heritage.